Did you know that email marketing is a star among all marketing means? It doesn’t require big investments but it generates real sales as soon as you send your first emails. Speaking in numbers, the ROI of emails is $44 for every single dollar that you spend. So how not to screw up and organize your email marketing effectively? “Learning by doing” is always the right answer. 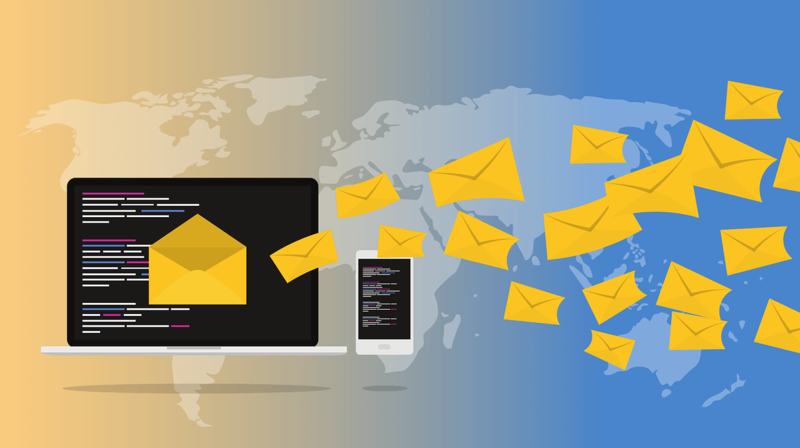 Yet, the following article will highlight the things worth paying attention to, when launching your email marketing strategy. The main email marketing benefit is an increase in sales. That’s obvious. And that’s the reason #1 to start implementing it. The second, people buy things from the online stores they know and trust. By communicating with your customers via emails you build your business credibility. Also, frequent communication will allow you to stay top-of-mind with your audience for a long time. The third, with email marketing, you can avoid the high expenses on the non-targeted marketing. You have more control who gets your promotions by segmenting your contacts’ list based on their buying history, location, etc. 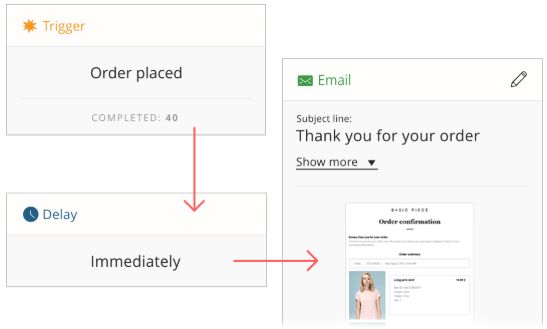 Targeting emails ensure that your recipients receive content tailored for them specifically. Besides, collecting your customers’ emails will help you to identify them on the internet. Use this for showing ads on social media and Google ads, etc. If you think carefully, you would find even more ways how your business could benefit from email marketing. So this is your beginning of the journey. There are many different companies in the market that offers email services. To be precise - almost 300. How should you choose the best one? Pay attention to the features that the company provides and your business needs. For example, Mailer Lite is a great tool and very price-friendly. But it doesn’t have a deep integration with your store, so a lot of vital for ecommerce features such as sales reports become impossible. 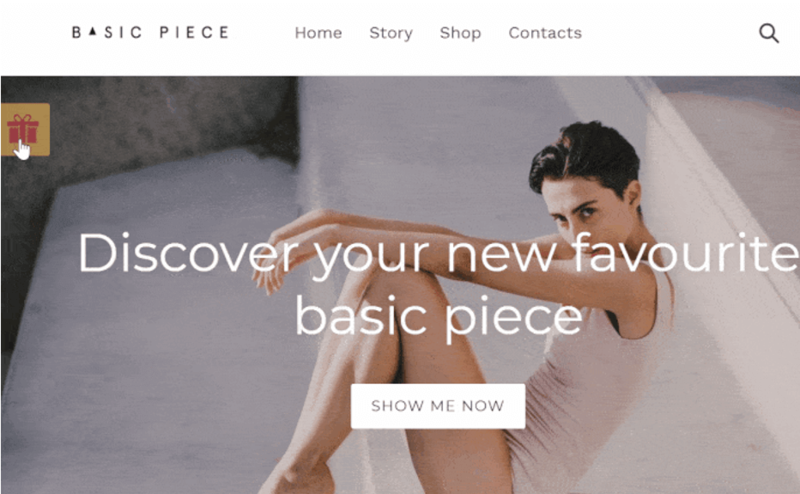 I see this tool perfect for lifestyle bloggers. You definitely know email giant - MailChimp. This is a great provider with a user-friendly interface and many useful features. You can give them a shoot. Also, there are a lot of great Mailchimp alternatives tailored to ecommerce sites. You can check out Omnisend. This service provides in-depth reports about your campaigns, has marketing automation features and a lot of other stuff that covers the entire email marketing and improves your experience significantly. Also, Klaviyo and Rare.io are worth a try. A vast majority of tools offer free trials or even the live demo. Use this before making your decision. For successful email marketing, you need emails of engaged customers. That people are interested in your brand - your loyal customers, store visitors, social media fans, etc. Using the email list built by someone else won’t generate you good sales. Furthermore, about 30% of your own contacts will get stale after one year. So building an email list is an endless process that requires your slyness as well as great tools. Here is what I recommend to try out without looking any further. There are a lot of different signup forms and they differ by their nature and results. Some of them are static - they are visible on your site all the time - at the top, at the bottom or on the side of the page. These signup forms aren’t the most effective, but they are useful at some point. The success rate of this kind of signup form can be about 1.3%. The more effective (±3%) are popups that appear on different circumstances and attract the site visitor’s attention. At Omnisend, we’ve learned that the popups that appear on the exit perform better than any passive signup form or even the same popup that appears immediately the visitor lands on your site. 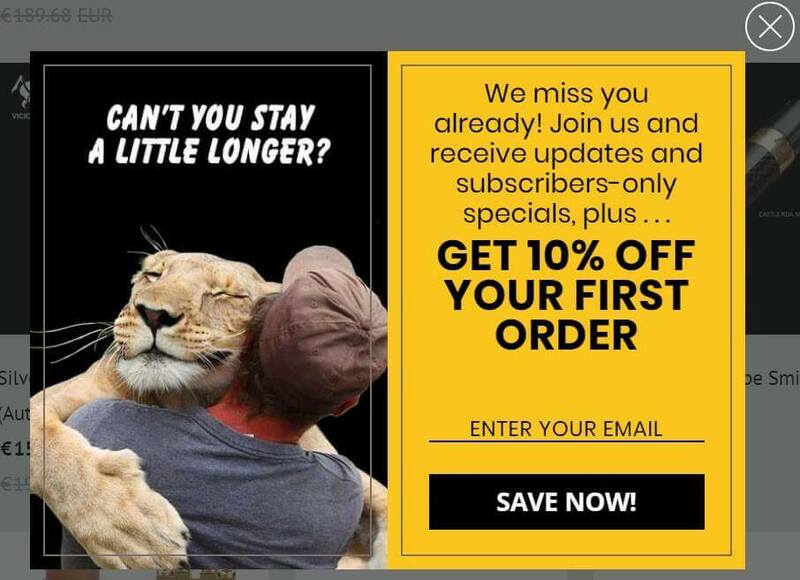 So you can start your customer email list building from this kind of popup. By the way, the popups on the websites can be like small hooligans: they can be funny, they can flirt, they can be different than the rest of your site. See the examples below. 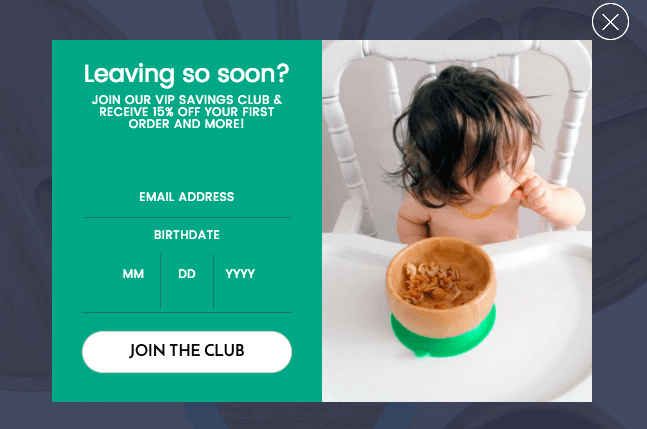 A highly interactive, playful, and fun signup form that ends up with a 10% conversion rate. This is a great catch for those marketers that want to achieve fast results. But show me, who doesn’t? At Omnisend we call this signup form the “Wheel of Fortune”, but you can easily find a few alternatives, like “Spin a Sale” or “Wheelio”. They all perform just great. The success of these forms lies in the gamification and interactiveness. They ask you to enter your email for the opportunity to spin a wheel and win a prize on your store. The prize can be a free shipping, a discount for the first purchase or giveaway - you decide on that by setting the form up. What is even better, after receiving the incentives, more first-time visitors dare to buy from you. Hence you get extra sales. Summing up, the interactive signup forms are much more attractive than the static ones. And they result in the greater conversion. However, don’t underestimate any of the forms and find the combination of them that meets your needs best. An automated email is a great way to approach your customers. It conveys a relevant message and it’s always on time. What is even better, automated workflows don’t need a constant upkeep. You set up them once and forget about these emails until you have new ideas for how to modify them after a while. Once they are set up, they do their work - interact with your audience and generate sales. That’s why I recommend launching them just after you set up your signup forms. Welcome emails. They are sent automatically to all your new subscribers once they signup to your newsletter. They help to introduce your brand and to better know each other. Welcome emails generate sales as well. Abandoned cart emails. 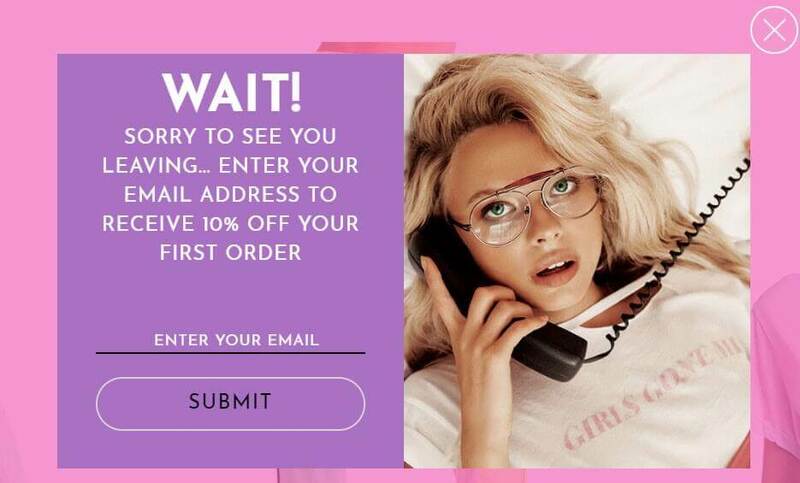 These emails are automatically sent to your known customers who’ve added items to their carts but leave your site without buying anything from you. Abandoned cart email works 20 times better than a single newsletter. And that is the most effective automated workflow. Birthday emails. This email with a special birthday offer goes automatically to the customers on their birthdays. For this workflow, you need your customers’ birth dates. You can collect this data by including this question into your signup form. You may also set up a customer win-back, order confirmation, and other automated emails. Remember, they help you to send a targeted message to your customers right on time. Well designed and a clear spotlight having emails always get more attention. Subscribers tend to read them more and engage with them more. Your business logo should be of high quality and with a transparent background. It will help you to look professional. Don’t use asymmetric email templates. In most cases, they are not mobile-friendly and look nice only for desktop users. Instead, pick a clean and simple, ready-made template from your email service provider. The designers and theme developers work for hours on that templates, so take advantage of that. Choose colors of your brand or neutral white. Subscribers will recognize you easier. Don’t put a lot of different blocks of content. Focus on one or two things in one email and clearly define sections by using spacing and lines. Very few people read endless emails, so it’s not effective. Don’t mix a lot of different types, colors, and sizes of fonts. Use only images of high-quality. When people buy online, their decision is based on product photo and description only, so don’t screw up. If you include product listing, use the same size and same style of images. Give your email elements some room. Images with ample space always look better. If you don’t have any great photos, consider creating images using nice typography. People tend to pay more attention to visuals. The most important, use big and clear call-to-action buttons. The button is better than the hyperlink on the words. People tend to click on it more. You can benefit a lot from implementing email marketing. Starting from the stronger brand awareness ending with the greater sales and loyal customers. For email marketing activities, look for an email service provider that focuses specifically on ecommerce. By using interactive signup forms you will collect your email database faster. Offer something to your visitors in exchange for their information. Automated workflows allow you to be relevant to your customers. They will increase your incomes significantly. Don’t overdo with your email design. Keep it simple and with a bold call-to-action button. I’m looking forward to your email! Our Guest Author is Karolina Petraškienėwho is a blogger and email enthusiast at Omnisend, the ecommerce marketing automation platform dedicated to helping ecommerce stores build strong, lasting relationships with their customers.